It was a milestone that took over 50 years, and at last solar panel manufacturers can produce their modules for less than $1/Watt. Now, the renewable energy community is faced with the dilemma that the permitting and interconnection costs, i.e. the paperwork, is a significant fraction of the cost of a rooftop installation. To deploy gigaWatts of solar energy in the United States these costs need to drop. In response, the Department of Energy has made permitting part of its Sun Shot Initiative and SolarTech has launched its Solar Permitting Challenge. 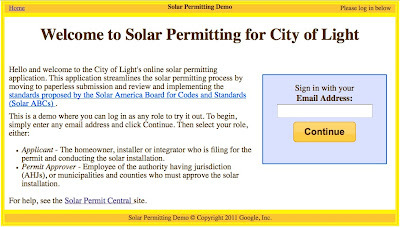 And now Google is pleased to announce Solar Permitting Code Examples to make it faster for software developers to be productive using AppEngine. A small team of Googlers (Alex Martelli, Arjun Satyapal, Clay Murphy, Luke Stone, Ross Koningstein and Dave Fork) pooled their 20% time to help out. We tried to make the task of building a web based permitting application easier by providing examples of essential tasks in AppEngine including login, creating new permit requests, uploading files, and gathering statistics. Two different versions, one in Python and one in Java, were created. 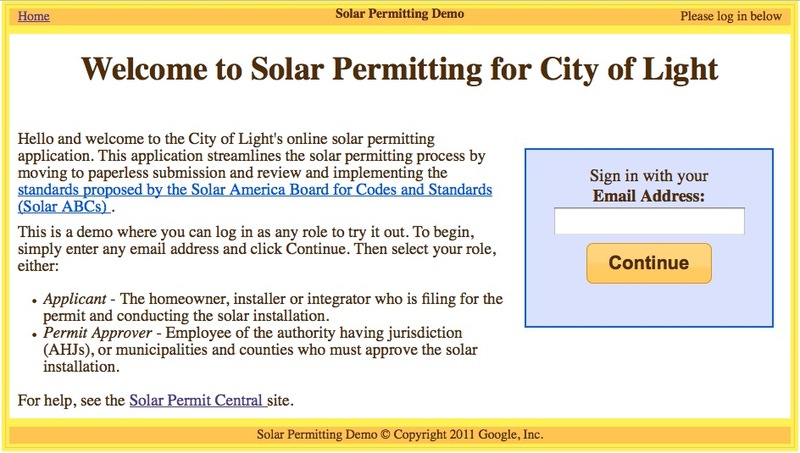 We were inspired to create this code example by the work that SolarTech has done to promote faster permitting through its Solar Permitting Challenge, and by the Solar ABCs efforts to produce a simple, uniform process for solar permitting. The user login screen for the Python code example appears below. Navigant consulting estimates that there are 700 gigaWatts of solar power generation resource on rooftops in the United States. Overall, we believe that efforts to streamline the workflow connected with rooftop solar installations could reduce the costs of installations by 50 cents/Watt. Please help us help the industry make this a reality.